This PDF 1.5 document has been generated by QuarkXPress(R) 8.16r2, and has been sent on pdf-archive.com on 01/05/2014 at 20:53, from IP address 84.249.x.x. The current document download page has been viewed 696 times. File size: 8.2 MB (34 pages). concierge desk, purchase tickets, grab a bite to eat, and see an excerpt of a show! 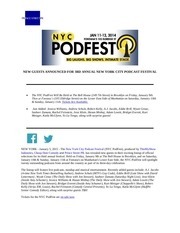 Check out www.FringeNYC.org for updates and to PLAN YOUR STAYCATION! What’s more 3D than FringeNYC? they’re doing it LIVE ON STAGE! kid to a FringeHIGH show and take in a FringeAL FRESCO performance! International Fringe Festival – New York’s Best Staycation! No Late Seating at FringeNYC shows! Ste. 311, New York, NY 10018; 212.279.4488. No latecomers are admitted at FringeNYC! Please bring your photo ID wherever you go. all the shows you can see! are other ways as well, and we’ll list them here. We are here to tend to your FringeNYC desires. FringeNYC shows under any circumstances. before showtime. Cash only at venues. How do we respond to disaster? the dark magic of the health care system. the location of the safe-house from him . . .
down the wrath of God on an entire family? town wants - whether he likes it or not. comedy. This ain't your traditional love story! the Badger for the soul of a budding nation. A bawdy history lesson steeped in legend. story about the values we teach and learn. dramas, written by witnesses of the era. piano competitions, PLUS hot accordion action! with a talking dryer? A wise 10-year old boy? the universe's most daunting questions? Saturdays August 7th, 14th, and 21st at a location TBA. Check below for Fort FringeJR dates and times! path to obscene wealth. Based on the bestselling book. Everyone's cheating: Why not you? can be found in the most unlikely of places. Two strong-willed swamp-birds discover that becoming friends requires a little give-and-take... or maybe a lot! This dynamic, interactive comedy explores diversity, problem-solving and ecology. Adapted from a Russian folktale, with a new ending every time! crafts for all ages Workshops at 3pm &amp; 4pm - Get there early to sign up! and whimsical show for children of all ages: from 3 - 103. It's Pee Wee Herman meets Late Nite Catechism. This file has been shared by a user of PDF Archive. Document ID: 00160380.